The notion that the 10 Commandments are the font or foundation of our contemporary legal code is largely Christianist wishful thinking. And the movement to monument-ize the twin tablets representing Moses’s transmission of the commandments comes off pretty much as cultural bullying carried out by a rather slim segment of fundamentalist Christians. This article, though written in a rather stilted fashion, elucidates much of the cultural strife that underwrites the movement as a competition between iconic texts, the Constitution for the secularists and the Decalogue for fundamentalists. Two things to note – one, the use of the Commandments as icon is relatively recent, and two, their actual content or their place within Christian theology or practice matters less to the movement than their symbolic force. I think that may explain the rather dismaying silence and even complicity of other Christian groups. And does anyone ever pause to think about why there’s only ever faint Jewish support for these monuments despite the ostensibly shared religious culture? Although I’m not aware of any official statements from Jewish groups, anti-defamation groups tend to regard these movements in a negative light as potentially disturbing to a carefully policed secular public sphere and therefore as actually threatening. So whenever one of the more backward states, this time Louisiana, decides to decorate the area about their courthouses with large-scale granite religious kitsch, it’s somewhat distressing if not entirely surprising. The recent efforts to place representations of the commandments in and about courts is interesting, though, for their approach. Rather than simply identify the movement with the importance of Christianity in American society, supporters tend to make a historic-cultural argument that in our largely Christian civilization the commandments have had a profound influence on the creation and support of our legal codes, and therefore the representations of the Commandments have historical, not religious, value when placed in a court. The argument based on the importance of Christianity itself to American institutions and society runs, of course, counter to constitutional prohibitions on the establishment of religion. Some applications of First Amendment law can seem a bit torturous or unclear, but not in this case – the violation is quite apparent. Hence the need for the dodge. This is also the crux of the 2005 Supreme Court decisions on state government religious displays. That twin decision held that the above monument, one of many donated to communities in the 1960s by the Fraternal Order of Eagles who were in part promoting Cecil B. DeMille’s film The Ten Commandments, was acceptable because it was one of many monuments displayed on the state capitol grounds in Austin and therefore of cultural and historical significance. In contrast, the state of Kentucky was forbidden in a companion decision from displaying framed copies of the commandments in its courthouses, as that gesture seemed to indicate an endorsement of the centrality of a specifically religious practice – that Kentucy “act[ed] with the ostensible and predominant purpose of advancing religion,” in Justice Souter’s formulation in the majority opinion. So bereft of a frontal attack in the matter – the ability to say that because most of us are Christian, the courts must recognize and commemorate that – it would seem that supporters of the monuments have adopted the historic-cultural argument that the commandments deeply influenced the history of American jurisprudence as a strategic end-run. “The significance is historical,” according to the Louisiana’s bill’s author. “Our laws are based on the Ten Commandments. In fact, without them, a lot of our laws would not exist.” Sometimes the formulation of this defense can’t help but reveal a bit of religious thinking: “The very foundation of law and liberty in America,” according to Herb Titus, the rather out-of-touch dean of Pat Robertson’s law school in Virginia Beach. The problem with this argument is that it is on the plain face of it ridiculous. As I’ve said before, to assert any connection between our laws and the 10 Commandments is to reveal an ignorance of one or the other, though it would be truer to say that the embrace of iconic texts often requires a certain degree of blindness to their history and context. There is a very clear and robust history to our legal code via British common law in the twin pagan sources of Roman and Anglo-Saxon law. There has been no discernible influence of Christianity considered at large or specifically the 10 Commandments on British or American jurisprudence. In fact, one of the remarkable things given European culture’s millennium-plus relationship with Christianity, is how very little influence Christian legal codes have on our common law – and in the case of the 10 Commandments, there seems to be no connection whatsoever. The one potential historical connection that could be made would be to the Puritan settlements in the Northeast. I should say at this point that while the Pilgrims made a profound contribution to American history and culture, the size of that role is typically overstated, ignoring the role of other settlements and their character on the development of English-language culture on this continent. Even so, there is where one would look, and where the argument gets made. And true in fact, the laws of the Massachusetts Bay Colony as expressed in the 1641 Massachusetts Body of Liberties include in its “Capital Laws” section what could be understood as a legal version of the commandments – and certainly the settlers saw them as such. Each is given, unlike the rest of the legal code, with its scriptural authority: “If any man after legall conviction shall have or worship any other god, but the lord god, he shall be put to death. (Deut. 13. 6, 10. Deut. 17. 2, 6. Ex. 22.20),” and so forth. Fascinating stuff, and prompts some speculation about the history of capital punishment, etc. But I think it should be quite clear as well that those elements with scriptural precedent and given with scriptural authority are precisely what was not preserved in our legal code. Now the Body of Liberties did prove influential in the development of our Bill of Rights and our notion of individual liberty, as much as it is a fact that one of the unexpected legacies of Puritan experiments in representative democracy was our contemporary notions of secularism. And it is quite plain on the face of the document that it is as much a religious document as it is a legal document. After all, there was no real separation between the legal and ecclesiastical institutions in Puritan settlements. That separation in our civic culture is the legacy of a very different if historically connected set of ideas. 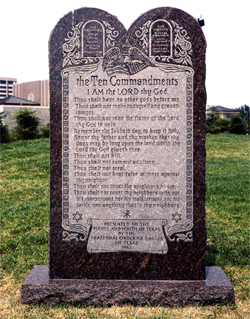 One would not want to dismiss the importance of Christian religious thought in the development of our democracy, but it’s important to keep in mind that 1) the 10 Commandments do not play a role in that, and 2) neither does the notion of God-granted prohibitions on behavior play a role in the development or justifications for our legal code. However, it is important to acknowledge the importance of the Judaic monotheistic tradition to our contemporary concept of democracy. In truth, it is a long road from the notion expressed in Isaiah that before God “all flesh is grass” to the idea that each individual is a sovereign agent equally deserving of dignity and liberty. But it does seem to me unlikely that our modern Western notion of democracy would have developed as such without the Mosiac innovation of a single and featureless deity. I’m getting this from Johan Gottfried Herder’s Spirit of Hebrew Poetry (1781–1782), one of my favorite works of Biblical criticism and one that’s significant in literary history for the transition from a theological reading of the Bible to a secular literary reading of it. The main English-language translator and promoter of The Spirit, incidentally, was James Marsh, a minor but significant transcendentalist and theologian. In Herder democracy seems an inevitable and organic growth out the idea of an all-powerful and abstract God to whom all were equally subject regardless of station. “The Legislation of Moses,” he writes, “had for its purpose the formation of a free people, subject to none but the law; and that no one might deprive them of their liberty God was himself the giver of the law, its guardian, and the king of its people.” The characterless or iconoclastic aspect of the Mosiac God cemented this equality, as there was no worldly characteristic that indicated any tie to any class. The invisible God was an impartial God, equivalent in a sense to the principle of justice itself. The words “democracy” and “republican” don’t actually appear anywhere in Herder’s text, but the obsession with a people freed from the arbitrary exercise of priestly and hereditary powers is clear throughout the second volume. Fascinating stuff. I wonder, for one, if monotheism would be necessary for the development of democracy. Monotheism is not necessary to sustain a democratic polity, obviously, given that India is the world’s largest. Nor was it necessary for the development and codification of our particularly American democracy, as that emerged at the moment when it became possible to envision alternate and non-theistic routes to equality and individual liberties in the emergence of the notion of Natural Religion (see the Ossian poems and their legacy, for instance – Herder was a huge fan of the forgeries). And the development of alternate and secular conceptions of the sovereign and equal dignity of each person was one of the important legacies of the comparative philological criticism of the Bible developed by Herder and his contemporaries. To respect this history in its creation of our laws and traditions, though, would require us to eschew iconic texts altogether, much like the motivation of Moses in Herder’s interpretation when he eschews all iconic representations of God.